Phrase: "I make predictions to give my brain a head start." Preview -- Look at the title, the cover, and take a teeny, tiny peek inside the book. Then read and I will see. In books I haven’t read. 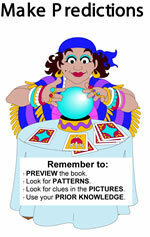 Making predictions is the first step toward making inferences. By teaching students the process of making predictions, they activate their schema and actively think about what will happen next in the text.